Cue the music, dancers on your toes, everybody ready, raise the curtain and let the show begin! 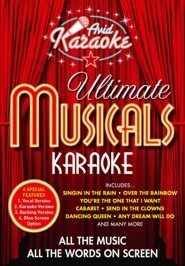 AVID Karaoke present the greatest Musical Karaoke ever on a fantastic DVD packed with 20 of the greatest musical numbers ever recorded. Our dynamic DVD will take you on a musical journey starting with songs from the classic era of the musicals with Singin In The Rain, Over The Rainbow and Oklahoma and many more. We continue our cavalcade of choral delights with The Sound Of Music, New York New York, Chicago, Memory, Dont Cry For Me Argentina and many more. Finally we conclude our journey by bringing you right up to date in Londons West End where we present songs from Wicked, Spamalot, Mama Mia, Jersey Boys and a sneak preview of a couple of classics from Oliver! 9. Id Do Anything As made famous by Oliver! 20. As Long As He Needs Me As made famous by Oliver!